One of the questions that you always see being asked of paranormal enthusiasts and investigators is this: If you could investigate any place in the world, where would it be? There are literally hundreds of places that come to mind for me...I love investigating historic properties and there are so many great locations out there that have a lot of potential. 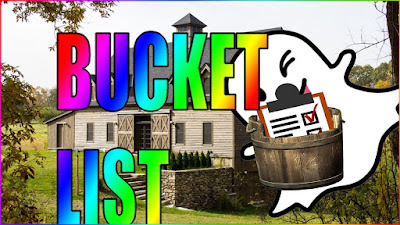 But, after much consideration, I've narrowed down my paranormal 'bucket list' to ten locations. I tried to pick locations that were kind of extreme---places that I'm extremely unlikely to ever get a chance to visit, let alone investigate. It's fun to dream, though, right? Let me know in the comments below what locations are on YOUR paranormal investigation bucket list! 2. The White House---The White House is one of America's most historic locations, and if you believe the slew of stories and legends, its also one of the most haunted! Of course, I'm drawn to the history and the potential to meet the spirit of a former president, but I have another reason for wanting to investigate here: just to say that I did! I would love to be the first private citizen to be able to publicly investigate and publish any findings. Even if I wasn't allowed to publish any data or even admit that that I was there, I'd still jump at the chance. 3. Disney World/Disneyland---The Happiest Place(s) on Earth have some pretty dark elements to their history, and various locations at the different parks have a reputation for being haunted. My favorite attraction is the Haunted Mansion...and maybe believe that it may actually BE HAUNTED. At Disneyland, the Haunted Mansion was used as the dumping grounds for the ashes of a deceased young boy by his distraught mother. After this was done, staff claim to have seen the ghostly image of the little boy...among other REAL phantoms. Make sure you click on the link to read more about the Disney ghosts. The ghost stories about various attractions are pretty well-known, but I don't ever see Disney tarnishing their family-fun facade with publicizing any actual paranormal investigations on park property. 4. Western Regional Jail---This jail, located in Barboursville, WV is just a short drive away from me. Built atop the site of a relocated cemetery and home to many, many untimely deaths during its years in operation, Western Regional has racked up plenty of ghostly tales. One of my favorite stories came from a former Correctional Officer who had to deal with a phantom inmate asking for a shaving kit! Since this is an active facility, and I don't plan on being arrested any time soon, chances are doubtful that I'll be experiencing the ghosts here for myself. 5. McMurdo Station---McMurdo Station is a research facility located in Antarctica, so yeah...the logistics of getting permission and traveling to the site just aren't going to happen! The stories from this location are interesting, though. Some of the ghostly sightings and experiences may be the result of a plane crash nearby, but what about the others? 6. Titanic Underwater Site---Again, this would be a complete logistical and financial nightmare, lol. Plus, I'm not SCUBA certified and quite honestly, am a little scared of being in the ocean. But how cool would it be to conduct an underwater investigation of such a historic site? Luckily, there are several exhibits that house Titanic artifacts that claim to be haunted. Some of those locations may actually be in reach. 7. Chernobyl/Pripyat---A radioactive town left stuck in time? Evidence already collected from several teams allowed in? This is a place I WANT to be, but probably never will. Even if I could secure permission to enter the site and investigate, my funding for a trip to eastern Europe is a little low right now. 8. Tower of London---Honestly, I don't see myself being able to travel anywhere out of country for an investigation, but if I could, I'd definitely want to start in Great Britain. The Tower of London has so much history, much of it rather violent, and there are any number of ghost stories that would make a great focus for a ghost hunt. Maybe one day. 9. The Amityville Horror House---I know there is a lot of controversy surrounding the events that took place with the Lutzes in this home. I am in the camp who believes that most, if not all, of what they claimed was entirely fictional...but that doesn't mean there ISN'T anything going on here! A family was brutally murdered here, which could definitely lead to some potential paranormal activity. Plus, how cool would it be to get to investigate such a well-known, but now off-limits location? *Bonus: Check out the facts behind this creepy photo caught during an investigation of the Amityville home---Amityville Demon Boy Photo. 10. The Library of Congress---I am a certified bibliophile and cannot get enough of libraries and books. Some of my favorite spooky spots are haunted libraries and this king of all libraries has so many treasures that I'd probably be too busy snooping around the collection that I'd miss any ghosts! Still, it would be cool to say that I investigated here, since I highly doubt I'd ever be granted permission to do so. Want more of Theresa's Favorite Haunts? Here's my picks for Top 10 Most Haunted Places in the World!